Time is running out: Share your Science Snapshot! 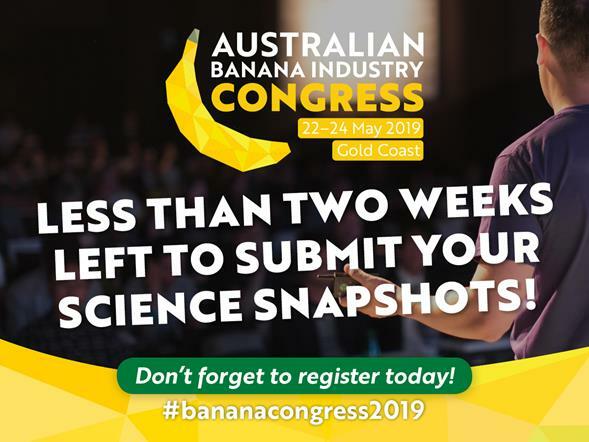 As you may be aware, the 2019 Australian Banana Industry Congress is currently taking submissions for the Science Snapshots session. This is a fantastic opportunity to present your research to those who will put it into practice –banana growers and industry stakeholders. There are opportunities to share your work as either three minute scientific speed talks and/or as a poster/interactive display session. The Science Snapshots will be an exciting part of the 2019 Banana Congress, showcasing important banana research. I hope you will join us on the Gold Coast. More details and submission guidelines can be found here. You can also find out more about Congress more broadly here. Please don’t hesitate to get in touch if I can provide any further information. This e-bulletin is produced by the Australian Banana Growers’ Council as a part of the Communications Project for the Banana Industry funded by HIA Ltd using the banana industry R&D levy and matched funds from the Australian Government. Previous PostEarly bird Congress registrations close tomorrow!